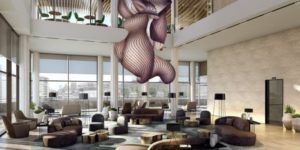 Marriott International’s Westin brand will debut in the United Kingdom with the opening of The Westin London City in 2020. The 220-key property is owned by 4C Hotel Group and managed by RBH, the UK’s leading independent hotel management company. It will have 8,900 square feet of meeting and event space, including a junior ballroom and four meeting rooms. The Westin London City will be a key part of the redevelopment of the former Queensbridge House site, as well as an independently operated destination restaurant. The site stretches from Queenhithe Dock – the oldest in London – and runs north to south, bridging across Upper Thames Street and giving it a prominent position over one of the primary arterial routes through the City of London. Highly visible from the South Bank, the hotel will also benefit from panoramic views over the River Thames and will complete the northern riverbank walkway between the Tower of London and Millennium Bridge. In addition, the hotel will offer the renowned RunWESTIN™ program with three and five-mile jogging routes along the riverfront and the brand’s signature Gear Lending program, allowing guests to pack light and stay fit with New Balance shoes and clothing for guests to use during their stay.